The images below link to full frame .dpx files, just click to download. At Idiff we had 3 sets to try out the various cameras capabilities, I only have the viper images at the moment, we also had Arri-D20, Panasonic Varicam, Panavision Genesis and A Sony f950. 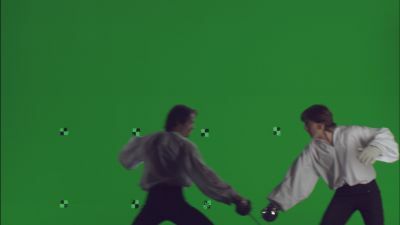 The first set was a low key green screen, we had a CG background to match the images to. I used a 90 degree mechanical shutter to sharpen the swords edges for the key. Green was at 50% with little/no reading in Red or Blue. Finally the shot that wasn't done ojn any of the other cameras, when I was a news cameraman I was taught to be there first and leave last.